We have given a thought to the problems our customers experience and found the solution by designing a fundamentally new door lock. What the customers expect of their improved locks? They want their locks to prevent even professional burglars from opening the door. The lost of the key do not pose a problem. Not to change the lock in case it happens that an offender is in the possession of the key. To get rid of a bulky bunch of keys. All such requirements have been taken account of by VLS® lock designers to make it the lock of the new generation. Technology and design novelty allow users to address any problems everyone may experience. VLS® door lock is enhanced antivandal protected - the hardened steel inserts are installed in the cross-bars of the lock, the scutcheon prevents drilling-out, it is impossible to reach the mechanism of the lock through the keyhole, therefore, the use of any kind of picklocks makes no sense. The scanning of codes is impossible. You may have your key replicated for less than 5 dollars at any of the thousands of workshops in any city. Who could replicate your key? Practically anyone - builders repairing your apartment; a person who installed your door lock; your babysitter; your housemaid; or a person who has found your lost key. Even an unskilled burglar is able to replicate your key or spy your code combination (in case the electronic locks with finger-board are used); it takes no time. Any lock does not protect your property, if any other person can replicate your key. VLS® lock memory is programmed simultaneously with up to 10 different codes, and you may easily delete or block any of such codes. One cannot open VLS® door lock with trial-and-error approach, as the lock has more than 16 million possible code combinations. VLS® lock memory is programmed simultaneously with up to 10 different codes, and you may easily delete or block any of such codes. One cannot open VLS® door lock with trial-and-error approach, as the lock has more than 16 million possible code combinations. Any attempt to enter wrong code switches off VLS® door lock for one minute. It will take a bugler 100 years to find out the code, and, for any burglar, time pays! For all VLS® locks the universal reconfigurable key is used, thus, simultaneous installation of VLS® in several doors makes carrying of a key bundle unnecessary. VLS® Lock Ensures Reliability and Safety. The free rotating hardened steel inserts are installed in the lock-mechanism (cross-bars) to prevent sawing. The protective plate of the lock prevents drilling-out. It is impossible to reach the mechanism of the lock through keyhole, therefore, the use of any kind of picklocks makes no sense. The outer handle design provides maximum protection against deliberate damage of the mechanism. A code scanning is impossible.. 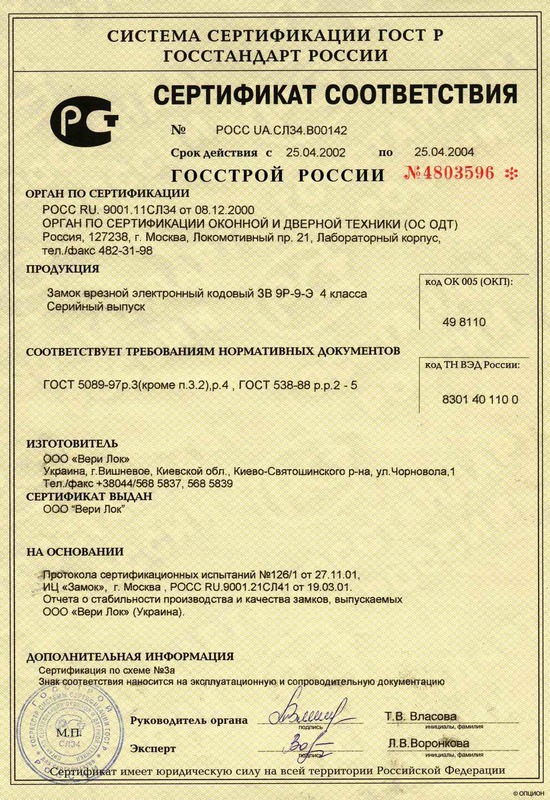 The access codes (including the master code) are entered by the user. He may reprogram the lock in no time without any special knowledge or skills. One cannot reprogram the lock being unaware of the master code, which is known only to the user. The maser code can be reprogrammed unlimited number of times. The access code and the master code are two insertions of the key. At the user's discretion, the code combinations may be identical or different. The lock is programmed with one key (see the Operating Manual). It is impossible to unlock the door being unaware of the access code. The highest level of security - the lock has more than 16 million possible code combinations. You may preprogram up to 10 different codes simultaneously, and delete or block any of such codes at your discretion. The door may be locked and unlocked on the inside by turning the handle without electronics. Leaving the premises one should just turn the outer handle and the door is locked automatically (the outer handle disjoins with the mechanical part and turns freely). See the Operating Manual to get more detailed information. Programming with up to 10 different codes simultaneously with the option to block or delete any of such codes. It allows efficiently managing the access to premises through instant deletion of the chosen codes, and their reprogramming or blocking. Blocking of lock at the attempt to fit a code: after entering wrong access codes, the lock produces a specific sound and a light signal, after three successive wrong code entries, the lock switches off for one minute making the access impossible (the number of wrong code entries and switch-off time are adjusted by the user). Batteries discharge level alarm, the system gives light and sound signals when battery discharge level is lower than 30%. VLS® locks' design and duties are perfect for apartments, offices, warehouses, restricted areas, hotels, banks, etc. 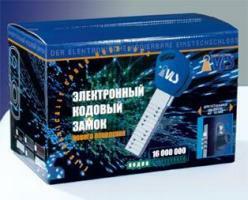 "The master key" + "the Master system"
For all locks VlS® the universal reconstructed key is used. Use VLS® in several premises is very convenient. The Master system "with various degrees of access to various premises, at the expense of possible simultaneous use to 10 various codes to everyone turns out". "The master a key" at us "the Master a code" (an access code) can be identical or various. At use of ours "the Master of system" is not necessary the special master on lock code conversion. Any user during pair minutes can reprogram knowing "the Master a code". Supersystem with unlimited quantity of code conversions. VLS® Universal reconfigurable key and its benefits. VLS® Universal reconfigurable key consists of 12 movable segments. The necessary code combinations are set simply by turning the key segments around the key axis. The number of possible combinations is over 16 million. Digital and letter signs at the end face of the key allows to remember the code easily. Using the key, you can easily operate any lock functions - entering and deleting of the codes, setting of the lock switch-off time, etc. Presently, we offer two key designs - the plastic design and the metal one. VLS® Lock power supply protection. Independent power supply mode (four AAA-type batteries); in 25 unlock operations per day, the lock will operate for at least one year. Light and sound indication of the batteries discharge for 30%; in this mode it will operate for two months minimum. In case of failure of the batteries, it is possible to connect the emergency power supply source via contactor located at the bottom of the outer scutcheon; the power supply source is 9 V battery of 6F22 type ("Krona"). The lock is insensitive to various high-voltage devices (including "electroshock"). 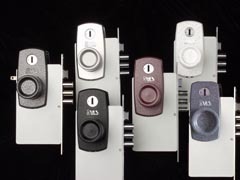 We offer a choice of scutcheons and handles of different colors. Customized color solutions are available. 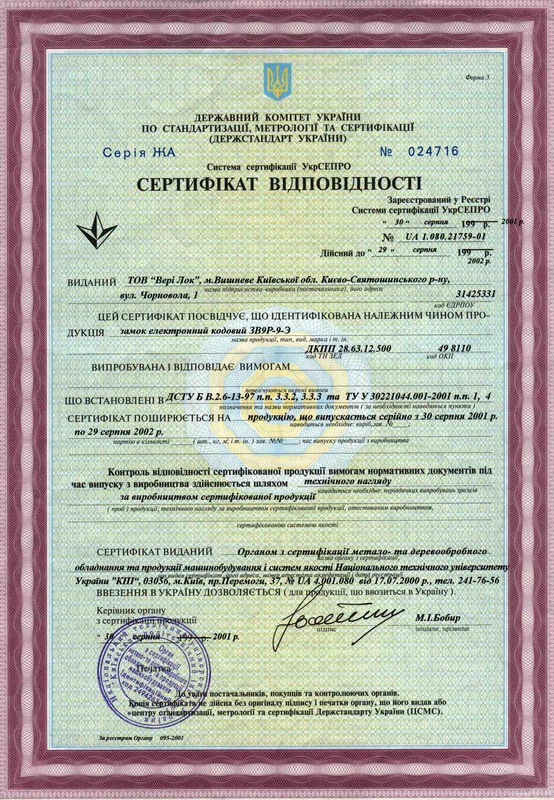 Company "VeryLock" carries out guarantee and послегарантийное service. The weight of the lock as a unit is not more than 2.5 kg. Strike plate - 1 pc. Installation cup - 1 pc. Mounting screws (5х10) - 7 pcs. Installation template - 1 pc. Operating manual - 1 pc. The lock may be installed into timber or metal doors 40 to 60 mm thick (base model), 60 to 80 mm and 80 to 100 mm custom made options are available; left and right doors opening both outside and inside. Power supply elements: four AAA-type batteries. The electronic part of the lock assembly includes the controller and components by Motorola Inc. The lock ensures compliance to the technical requirements within the temperatures range of -40o to +60o C provided that the appropriate power supply has been selected. Specifications are stipulated by TU U 30221044.001-2001. The full-scale production of the VLS® lock has been certified in Ukraine and the Russian Federation since August 30, 2001.